Roholt Vision Institute provides friendly, professional care that supports the long-term eye health of adults of all ages. Our services range from medical eye exams to surgical treatments for serious eye conditions. While the eye diseases that are normally addressed by us occur in adulthood, we cannot overlook the need to remember the children. 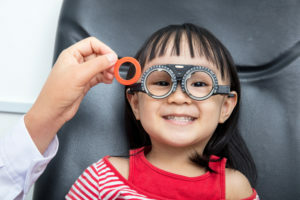 In honor of Children’s Eye Health and Safety Month, we want to give some attention to the needs that young children have for eye exams. If you have a child in your life, you want to know this . . .
After bringing a baby home during the first days of life, parents are usually prepared to visit the pediatrician’s office at least once a year, more so in the first 12-months. General physicals are intended to monitor a child through various developmental stages. In the same manner, eye exams assess vision, and ocular structure as the eyes rapidly grow, and vision becomes refined. This may come as a surprise, but a child’s first eye exam should take place at 6 months of age. The reason for this recommendation is that, from birth to six months, the eyes are developing at a rapid pace. At first, a baby visualizes primary colors that are not far from the eyes. As a baby approaches six months, the eyes are better able to see more colors and farther into the distance. This is an opportune time to evaluate the structures in and around the eyes to ensure they are functioning properly. Early eye exams can be much more telling than you may imagine. As early as the first exam at six months, it is possible to notice laziness in one eye. When “lazy eye” is detected early, the muscles can be strengthened by applying an eye patch over the stronger eye for a short time. During these early exams, it is also possible to detect refractive errors, such as nearsightedness and farsightedness, and manage them with corrective lenses. Children should also undergo an eye exam between age 3 and 4, and once a year once they start school. The child’s pediatrician may be able to recommend an ophthalmologist who specializes in treating children.